This is the fourth and final article of our four-part series on kitchen cabinetry choices viewed through the lens of the zodiac. The twelve zodiac signs are each associated with a main element: earth, fire, water or air. We have already covered water, earth and air in our series. A fire sign’s kitchen is almost guaranteed to be gorgeous and grandiose! The Leo loves the grandiose. Just like the King Sun, they wouldn’t settle with anything less than a five-star kitchen, concurrent with the latest fashion trends or just like the one they saw during their vacation on the French Riviera at the apartment they rented. The Leos are famous for their optimism, and they will be looking for their kitchen to last a lifetime, so that when their great grandchildren come over decades down the road, they have fun making cupcakes in the still amazing kitchen. One of the darker solid wood RTA kitchen cabinet lines is perfect for them, combining amazingly low budget prices with lifetime quality and stability, and, of course, the highest level of elegance and style! Check out some of the lines, such as the Bordeaux Shaker and Bainbridge Chocolate here: https://www.rtacabinetstore.com/RTA-Kitchen-Cabinets/. 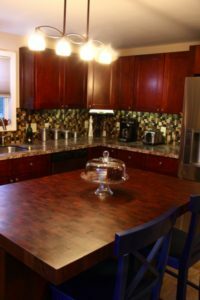 Aries Wants a Natural Place – Medium Solid Wood Kitchen Cabinets for Them! Aries is out for a thrill, so their kitchen would be anything but boring. There had better be space for the best kitchen multi-machine for the healthy smoothies they drink right before running the annual marathon. Aries are not scared to experiment and their creative spirit might result in a kitchen that looks like an amusement park. They like to experiment, so among their belongings you’ll probably find there will be a pasta machine, used creme brulee pots, a sushi rolling mat and a wok. If you thought it was impossible to combine plants and electrical appliances, they’ll prove you wrong by having orchids hanging from the lamp. Natural Shaker RTA kitchen cabinets are very popular with this star sign, and for good reason! When the Sagittarius gets their kitchen set, it’s a one-time deal for them! This amazing designer space will have all you might need, fit for royalty. The Sagittarius knows what he or she wants and is not shy to ask for it, so they’ll get the most feel-good place that money can buy. Fortunately, money can buy a heck of a lot when it comes to RTA Cabinet Store’s RTA kitchen cabinets, so the Sagittarius is like a kid in a candy store when shopping from the site. They have a broader range of tastes, but all leaning towards elegance, so RTA cabinet lines such as the Heritage White, Cherry or Butterscotch Glazed, or the Healdsburg are perfect for them. We hope you enjoyed our mini-series of articles on the zodiac of kitchen cabinetry choices. You’ve gotten a lot of information about kitchen cabinets, and we are here to help you take it to the next step. Get help today with a free kitchen design consultation by one of RTA Cabinet Store’s professionally trained designers. Just go to https://www.rtacabinetstore.com/free-kitchen-design-help or give us a call at 1 (610) 337-5934 to get started! ‹ Kitchen Cabinets Too Expensive?